I'd like to think injuries & in particular how they happen & are managed by players have been looked into, it's fairly common for players to still make appearances with any number of niggles or ongoing minor injuries while some will continue to play while carrying a fairly serious injury that are either known about but deemed okay to play with based on a risk/reward assessment, go undiagnosed until a point that the player breaks down or are even hidden by the player for fear of being sidelined for too long or losing their place to another player, suiccessfully add these aspects to FM & I'd be a very happy FM'er. Now it's got its own thread, I'd like to make a more general point on this year's game from what we've seen so far. I think everyone would agree, as good a game as it was, the leap from FM16 to FM17 wasn't particularly great. The new features in FM17 only just stopped it from being a glorified data update from the previous game. This year looks serious though. Many key aspects of the game seem to have had their biggest overhaul in years, in addition to exciting new dynamics in the form of, er, dynamics. All of that is rendered meaningless however if the game's match engine has regressed. This is still a key area we're waiting on information on. A new graphics engine sounds promising though, as one of the more disappointing aspects of the game since the switch to 3D is how poor some of the animations still are, particularly goalkeeping. Overall though, it's the most I've looked forward to an FM game in a long time. 'Mon the Beta!! Agreed, the game will live or die by the ME & match animations. All the announced features could be absolutely perfect out of the box but if the ME has many of the same issues that have plagued it over recent years I for one will be unhappy & if there's any hint of a persistent flaw such as the crossing issue from 16 or wide defending from 17 then all these new outside of match features could be utterly pointless. Just make players shift and strikers to defend and it's good. Well not really as in this situation the attacking side of the game would actually need new tools so that the game wouldn't be producing endless number of 0-0s as even with the state defending worked on FM 2017 there really weren't too many goals scored compared to statistics and this for sure wasn't down to well organized defending. Tools like creativity, good finishing and long range threat still are a bit missing and for sure free kicks are not as threatening as they should be. Fabregas for me is one of the type of player that the ME is missing. Lost count yesterday on how many long range through ball he tried to play and even if any goals weren't scored from those there is always that threat when you play against him if you give him any space. Or the Hazard run where he darts rapidly against the defensive line and while the defenders do fairly well, he is still capable of finishing from chances that aren't actually even half chances: outside the penalty area from full speed. This kind of finishing is really rare on the ME while IRL this is the stuff that top quality players can produce. In the ME it's simply too easy to create those really easy chances because of what the defending is. Luckily if the ME still keeps on the same foot steps then is always an option to go with only commentary and imagine things yourself, lot of the detail drops but it's alright. Hopefully the transfer system gets some kind of overhaul and becomes more realistic and challenging to master. Also to make me play longer term saves I surely hope that the newgens are now better designed and they don't have superior physical attributes. Those for me actually influence even more than the ME on my gaming experience. What i do wonder is... of these new features being announced what will be included in FM Touch? How about some actual ME footage? An 8 second video is not enough. As a matter of fact how about some actual screenshots of those things announced? I would like to take more closer look at those, instead of pausing a video. The lack of FMT news is baffling & just reinforces the perception of it being the less important little brother that people should not be interested in. They're not going to show you every screen, that'll be what the demo is for if you're still undecided. The next feature video will more than likely be based around the match engine/graphical improvements. That & the hope for a new approach to training. I've just watched the features video again and that is the one thing that Miles didn't mention at all. Hum... the beta (what i call the game when is release two weeks prior to official release, only for those that pre-order the game) is release two weeks before release, that gives about two weeks of future video announcements. - I predict, one about the "Graphics Engine" whatever that means. Probably ME video is included in that, despite it will have a separate video with some best highlights of the ME. - One about Transfers (which was included in Miles Hangman twitter game). - Another one about a Fantasy Draft Revamp (and multiplayer announcements). - Not sure about if Player Instructions (Miles Hangman Twitter game), was included like the new roles one. -I probably predict a video about FMT and FM Mobile (probably seperated). But that would be within the two weeks the beta (who pre-order) and the official release of the game. Most likely in the final week before release in November. - And on the release a list of new features of the Editor on the Editor sub-forum. One one hand I fully agree, but on the other I'm wondering what they can realistically do to improve FMT while keeping its nature. Adding modules like dynamics would go directly against everything FMT stands for. In general, they've deliberately streamlined the game and adding any new mechanism is contradictory. The only thing FMT misses right now are some more information screens like "how many days to gain nationality". In other words, making information already in the game visible to players, not necessarily adding new. Sorry if I am in the wrong thread but I have some ideas I wish will be added to the new game. I am very rarely on this site, and my english is not the best but hopefully I can get myself understood. Theres a lot to say, but these are the ones I can remember at the moment. 1. The option to be an actual manager like Jose Mourinho. Instead of creating your own, you should be able to BE a manager like Jose Mourinho, Marcelino Garcia etc. So you don't have to delete the manager in the editor. Don't know how much work this would be though, with links between favoured people/history etc. Would be cool tho! I like to have one save-file when Im playing with my favourite team and being the current manager and another save when I am myself starting as unemployed. 2. If a winger is a natural winger, he should have the same rating in that position both in the AML and the LM position, as the same role(Winger) is available. It's really annoying if you want to play 4-4-2 for example, and all the wingers have a green "circle" in the AML position but yellow in the LM with the same role(Winger). Makes no sence, in my opinion. I understand that the classic Wide Midfielder are very rare these times tho, but moving a WINGER down one step a bit should not be different in quality IMO. 3. The tips that pops up when you go forward in the game are very useful, sometimes I don't have the time to read it. You should be able to pause/or read the tips somewhere else. 4. Please fix the graphic layout on the tactics section. The "squares" looks really boring. It should be a shirt or something. What I loved about FM 17 was that in Spain you can now keep the youngsters in the U19 team and still let them play for the reserves, without moving them down(that way they get much better training, and and you don't have to loan them out etc). Please KEEP this feature! there is a feature request forum for ideas. The first one was already posted, probably more than ones. So apparently nothing will change in terms of training. A bit heart broken because of that as this is the area that definitely needs something new to it as it simply is boring and not challenging. Where do you get that nothing will be changing? Just because there isn't a feature video for it doesn't mean it won't change. At least wait for the game to come out before jumping to conclusions. I bet that if there would be new features in terms of training they would exceed the news threshold and also I said 'apparently'. But it's conjecture at this point. Often the best features that SI bring in are nowhere near headlines, and more the smaller ones that build up to make the experience a lot better. To take a tweet that simply gives you some headlines, you've derived that there will be no changes to training. There very well might not be, but there's no way to be sure at this stage. Football Intelligence is intriguing, and 'matchday' could be anything. No interest in the fantasy draft stuff, and the match videos will give everyone the chance to moan about how nothing's changed. I posted in another thread that the ME video is going to have negativity and moaning regardless, not everyone will be happy with every change. Guaranteed. There will always be something in the 'work in progress' videos that someone dislikes, or thinks is wrong. Like you, I have no interest in the draft so the other videos are what I am waiting for. Yeah but I reckon a change in training would be one mountain too many. That is a fundamental change to how attributes are going to be redistributed in the game. It's too big a change to introduce with the rest. 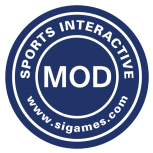 If you notice, medical centre, scouting and dynamics are modules that do not fundamentally change attributes, so rolling these out is less disruptive so to speak. I have strong feelings that the training module is on the list of things they want improved, but I doubt it will be for FM18. SI can't please everyone, all they have to go on is their own internal roadmap. They need to get these modules out before they can even take a look at re-writing the match engine and when that happens, I suspect the training module will get a revamp. These two are linked so replacing the legacy code which is on their internal radar seems to be very likely but not on FM18. We've been down this road before, I was there when we re-jigged the first match engine. If all goes to plan and the 2 week timeline is followed, then we could all find out on Oct 25/26th? I'm a little confused over the pre ordering of FM18 and the advanced demo if you do that. Today, I pre ordered FM 18 in my local Game store. I asked which of the four numbers on my receipt was the code for the demo. I was told that there is not any advanced demo even if you pre order the game and pay the £5 as it is available only on Steam. Will I get the advanced demo of FM 18, after pre ordering like previous years, or not? The Beta is only available for digital copies from certain retailers, not boxed copies - the information and links to approved retailers are in the first post in the thread. I hope dynamics will play a part in making things hard for example coaching Barcelona or Real Madrid with a low manager reputation ratings in the start of the game. now you can take any manager reputation and just coach the big clubs with Galaticos. These club players are big name players and they won't take too lightly with an amateur manager coming in and coaching them. They will player power and you really need to manage all the Egos which is the much bigger challenge than tactics. I hope this kind of stuff gets replicated in the game. id like to see that, too. Players really annoyed that unknown managers are being appointed. Thanks michaelmurrayuk. I wasn't too sure about that. This appears to defeat the object of pre ordering the box copy as I've done for many years so as to be able to play the demo. I'm somewhat disappointed with that, I must admit. Never mind, heh! 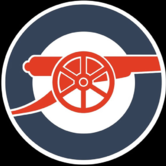 If it follows the current pattern of Sunday, Tuesday, Thursday, it will be tomorrow, leaving "Football Intelligence" for Sunday, Match videos for Tuesday and Beta for next Thursday. This speculation is entirely my own work and does not represent the opinions nor speculations of SI, SEGA, or any of their partners or subsidiaries. Video with 3d gamplay should be right now! It very, very important for lots of fans, I dont get it why it is still delayed???? Maybe SI knows that when they release 3D match video then not so many fans will preorder. I'm quietly hoping it follows last years timescale which would mean the beta is hopefully released as early as next Tuesday. Last year the release date was Friday 4th Nov with beta expected 2 weeks before (Friday 21st Oct) but it was actually released on Tuesday 18th October. So with any luck this year might go similar. Official release Friday 10th Nov, Beta expected Friday 27th Oct, actual beta release Tuesday 24th October. Pretty please SI. Does anyone know where the cheapest place to buy the game that gives you access to the demo? I missed the Steam sale. Good work, if my maths are correct, and going by SI's own announcement, then the beta is at some point next week regardless? Well, the wording used this year is "beta will be available two weeks before release". Last year was "at least tow weeks" and previous years have been "around two weeks". 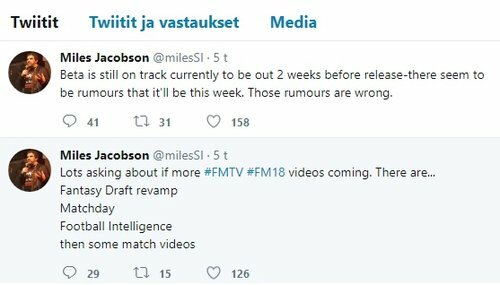 I believe Miles has tweeted that everything is still on track for "two weeks before", but has only confirmed that it won't be this week. without wanting to open up a can of worms, i would assume it would need to be 2 weeks minimum or the entire "beta offer" is false. Lets not get into that though lol, fingers crossed for next week. I hope you are wrong and the 3D anamations are really improved, Most things I have seen in the videos so far are already in the game, although I agree they are much cleaner and easier to find. If the matchday is not somethiong really special I will forget FM18 and quite happily carry on with my FM16 save until it is. I've been waiting for ages to see player's sliding being removed in the 3D match. I sure this won't happen in the following FM but I don't now why... players move physics looks awful. Lately I've watched FIFA comparison from 2001 to 2018. Yeah I know that FM is not FIFA, and I don't expect that, but honestly - FIFA 2004 clashes FM 2017 as to player's move physics It's a damn decade!!! Is it so hard to make animations look like in say FIFA 2010? There is absolutely no point comparing FIFA to FM, as they have to simulate animations in very different ways. He was not really comparing he was saying ( and i agree ) that after a decade in FIFA has seen massive improvements in animation and FM still has animation that belongs in the past . You know you can turn them off? I reckon they'll keep them in the game tho. Wow finally someone understood what I was trying to say. Thanks mate I don't expect FIFA in FM but I do expect that FM would not be archaic. Yeah I know that there are fm fans satisfied with only 2D mode, but I'm not and if SI set 3D gamplay it should be really improved. So, if SI could emulate PES movements on FM 3D gameplay, would be perfect? Altough i agree with you, i think we are forgeting something here. Despite FM and FIFA (or PES) being completly different games, and because of that with different needs, and objetives, in termos of development, the truth is when SI bring 3D animations to the game it was with the purpose to give a fresher graphical look to the game and, with that, bring more players to the game. You don't need good 3D animations to make the best version of FM (something that you need to improve FIFA or PES), but you need them to aproach new markets and, with that, new players. And because of that i also agree with @armbi: 3D animations didn't improved as much as in others games in the last 10 years. And that's because perhaps for SI (and i agree with that) 3D animations are a smaller part of the equation, when compare with the ME, scouting, and all the other parts of the game. In the end of the day you have a budget to make the game, and you will spend it in the areas you think are more important. For someone, like me, that start playing the game when all we had was the text bar, i look at the 3D animations like something that it's not essencial to the game. I learn to love the game playing in a different way when compare to player that perhaps only know FM since 5 or 6 years ago. For those players, 3D animations take a much more importance, and let's be fair they are the future that will keep giving SI the money that need. So i can understand that tehy feel frustrated that the years go by, and the 3D animations, that fulcral part of the game for them, keep giving very small steps. Things like "this year we have 100 new animations" don't do the trick anymore. And there may be a lot more possibilities in the future with a new graphics engine. There wouldn't have been a move to one if it wasn't the case, but I'm obviously speculating. It's pointless to speculate. It is said to be around 2 weeks before, so that's what it is. Maybe don't take it so personally. At this point, SI don't even know when exactly it's going to be released.